This guide is not on how to create loops or how to program drum patterns, it’s on how to use the track sequencer and building a song with the 500 MB of drum loops from Big Fish Audio that come with the R8. The looping concept is time based and uses bars, beats and tempo, therefore you will get the best results if you use the metronome as much as possible. 8 tracks is very limited especially when you’re going to use stereo loops (you can only use 4 loops at a time) so in order to create more variation I’m going to use multiple projects to create one song. I do this by simply mixing a project to the mastertrack and importing the resulting master wav file in the other project. It helps, when you want to change something later, to easily reload all the projects you used to create your song. Create a fresh new project and make sure the rate is 44.1kHz because the Big Fish drum loops we’ll be using, are also 44.1kHz and you can’t use them if you choose 48.0kHz. The tempo of our song will be 100 BPM, so hit the tempo button and adjust if needed. The loops we are going to use, are also 100 BPM and the tempo needs to be 100 BPM if we want to line up the loops perfectly. So it’s important to have the steps right for setting up the loops so I will do this step by step. 1) Press the track button and make sure the track indicator of the first track is lit. 2) Press [Enter] while the first option (TAKE) is selected. 3) In the next screen, scroll down to “LOOP” and press [Enter] again. You will now see a list of maps starting with “070 BPM”. As opposed to a drumcomputer these drum loops are real audio recordings of a real drummer playing at a certain BPM and although you can stretch and compress these loops it’s best not to compromise on sound quality and use the loops with the same BPM as your song. Now there are numerous ways to compose and create songs, some poeople plan it right from the start and they will work out every detail right down to every hit of the drummer. However I like to be inspired by other musicians even if they are prerecorded loop based. So I got a rough idea of what I want: a mid tempo song which builds gradually into a rock song. I want it to start with drums with a somewhat stripped rhythm. Again we see a bunch of maps, this time representing a certain style. Finally we got down to some loops, now in order to determine which one to choose, it would be nice if we could hear them before assigning them to a track. 8) Scroll down to “100 Dry Harder 05.wav” and press [Play] to listen to it and [Enter] to use it. Now let’s take a short break to look at what we just did. We’re back in the main track screen and we see the name of the loop we selected moving like some sort of marquee, LOOP is still set to “Off” and for now we leave it that way. Notice the track indicators for both the first track and the second track are now lit because the loop is stereo and the R8 automatically turned on the stereo link. Press [Exit] to return to the home screen. All the track indicators turn green, nothing special there. OK raise the faders for track 1 and 2 and press [Play], what you will hear is 1 bar of drum playing. Also notice that pressing the drum pads doesn’t do anything. So what we’ve done is simply load a short wav file to track ½ and that’s just what these loops are: simple short wav files. They came from a directory on the SD card called LOOP but their wav files just the same. The LOOP directory is nothing more than a collection of short wav files most of them only 1 bar long. You can easily expand this collection with loops of your own by adding them to the ZOOM_R8/LOOP directory including sub maps of your liking to keep things organized. OK let’s go back to the track settings by pressing the track button. This may be confusing, just now we selected “LOOP” in the “TAKE” submenu but that was to load a LOOP file, the menu option we’ve now selected , not in the TAKE submenu but the second option in the main track screen is to set the track in LOOP mode which is something completely different. It would have been better if they had called it something else like LOOPMODE and there is room enough in the display for a name like that. For terminology sake I will call this option LOOPMODE from now on. You can go a menu deeper to set the start position and length but this is not necessary for readymade loops so we skip this and save ourselves some extra buttons to push . Notice that turning on LOOPMODE will show the parameters for the next option “PAD”, more about that later but you can guess the pads will be functional now. 13) Select LOOP again and browse to the same map we were before (100 Harder) and select “100 Dry Harder 10.wav” track indicators for track 3 and 4 will be lit, telling you the loop file is loaded. 14) Set the track to LOOPMODE by selecting LOOP and turning the dial to the right. 15) Do steps 11 to 14 again for tracks 5 and 7 but this time load “100 Dry Fills 01.wav” and “100 Dry Fills 04.wav” from the “100 Fills” map. If you don’t leave the track screen, selecting and loading these loops is easy and quick, in fact you will spend most of your time listening to the loops and choosing one you like. 16) Press [Exit] to return to the home screen. Now let’s have some fun and play the pads. The pads will trigger the loops and it’s like you got individual play buttons for each track. They act in pairs because the stereo links are on and you only have to press one pad of each pair. – The blinking of the pads indicate the loop is ready for playback. – The pads are lit without blinking during playback. – To actual playback starts when the pad is pressed when a new global quantization setting unit comes along. – A loop keeps playing if the repeat/stop pad is pressed together with the track pad and stops if you press the track pad again. This really sounds complicated doesn’t it? Think of it as being Lego bricks which have to fit exactly in place. The predefined bedding is what you set with the global quantization. The default value is 1 bar which means a loop can only start at the beginning of each bar, and since the loops we loaded have a length of 1 bar; it’s a 1:1 situation. With these settings it’s impossible to start a loop on the second beat or anywhere else than on the first beat, we are not going to do anything fancy only complete bars so actually this is a good setting. Don’t use the play button just yet because if you do all the loops will start playing simultaneously and that’s not what we want right now. Rewind to the beginning of the song and press the first pad, notice the loop on track 1& 2 is played once. Rewind to the beginning again and try to start the loop on track 5 & 6 when the first one on track 1& 2 is finished by pressing pad 5. If you pressed pad 5 exactly on the first beat of the second bar there’s a good chance the second loop did not start at all and only the pads blinked, if this happens you simply started the loop too late. Blinking indicates the loop is ready and it’s waiting for the first moment it is “allowed” to play, which is at the beginning of a bar (the global quantization value). This waiting is what you need to do playing the pads too. Instead of removing your finger you keep on pressing the pad until the loops starts to play. So what you do is press the pad well before the loop should be played (well before the first beat of the next bar) the pad will blink telling you the loop is ready, while still holding down the pad you wait for the first beat and the loops start playing and then you release it. If you wanted the pads to respond directly, you needed to set the global quantization to HI, so you could play separate drum instruments like with a single snare sound and so on. But we’re not going to do that now as we want the loops to be played perfectly in time. As an exercise, try to alternate between the loop on track 1 & 2 and the loop on track 5 & 6. – Press the pad of the next loop you want to playback while the first loop is still playing and hold it. – The pad will blink while you still keep pressing it. – Wait till the next bar and the second loop starts playing then release the pad when it does. – Keep doing this with the two loops until you got the feel for it. For my song I think I’m going to use this as an intro then I want a fill to go to the heavier part, have that play a few bars and I’ll use the fill again as an end. Try to play this complete sequence and remember to press the pads in advance and hold them till the loop starts. TIP: Bar 7,8 and 9 use the same loop, if you press the repeat/stop pad together with the track pad the loop will keep on playing until you stop it by pressing the track pad again (not by pressing the repeat/stop pad as mentioned in the manual). If you got the hang of it and you are able to play the above sequence we are ready to record it. Press the track button, scroll down to “TRK SEQ” and press [Enter]. It doesn’t matter for which track you do this you still end up with the same track sequencer. So although you fire it up from the track menu for a specific track there is only one track sequencer. It’s not the most logical menu to put the track sequencer in, I would have liked it to be in the main/home screen, you can turn the track sequencer on and off in the home screen but you can’t fire it up. And the first soft key is not even used in the home screen so please Zoom, if you read this, don’t leave the first soft key unoccupied, use it to fire up the sequencer. The track sequencer is like a separate recorder on its own, with all the transport controls fully functional. Play, record, rewind, rewind to the beginning with the [stop] and [rew] buttons, everything functions just like in the normal recording section. We practiced the above sequence so now it’s time to record it and yes this is done the same way as with normal recording, so rewind to the beginning, press the record button and the play button together and away we go. Notice that you can’t first press record and then play, you have to press them together otherwise the track sequencer won’t start recording, if you have done it right the screen will say “Now recording…”. If you’re done press [stop], rewind to the beginning and press [play] to listen to what you just recorded. Now that was not so hard was it or did you make a mistake? Too bad, if you want to clean the track sequencer to start all over again you have to do it in step mode but we will come to that later, first let’s have a look at the track sequencer screen. Recognize the sequence we just recorded? Every square in the grid represents a bar. We started with the loop on track 1& 2 for bar 1, then we played the loop on track 5 & 6 which you can’t see, you have to scroll down to see them, then again the loop on track 1 & 2 and so on. We also finally see the notorious “Global quantization” setting here, it’s easily the most important setting if you’re working with loops and you can only edit it right here in this screen. You have to use the cursor to highlight it and set it with the dial and you cannot set it while in step mode. If it is set to “1 bar” loops can only start at the beginning of each bar, if it’s set to “HI” loops can start at every 1/32T note so nearly anywhere, it really makes all the difference if you are playing the pads in real time. Now that we’re a little familiar with the basic track sequencer screen let’s move to step mode. To enter step mode, press the [Rec] button, notice that apart from the record led, you know you are in step mode because you got 4 soft key options which are otherwise not available. There’s really a lot you can do in step mode and you often will find yourself here doing little tweaks and stuff, but that’s OK, it’s easy enough to quickly enter it while working with the track sequencer, you just got to know the functions that are available so you know what to look for and when to open it. For example, you can move the cursor around on the grid and input a starting point for a loop by either pressing [Enter] or the appropriate pad (saves you a little bit of navigating). Or, if you want to delete a loop, move your cursor to it and press the delete soft key. A clever function is the flexible signature, it is possible to set a different signature for every bar. Just move to the bar you want to change and then move the cursor to the signature sign then you can use the dial to insert any signature you like and you can delete it with a soft key. There’s also a soft key called “edit”, this houses functions to insert beats, delete beats and delete events, I guess they speak for themselves but it’s nice that you can set the number of beats you want to delete (or insert for that matter). In our example exercise we made a sequence of 10 bars, now if we want to start all over and clean up the track sequencer we could delete all the entries individually but with the delete beats function under the edit soft key, you can clean up the track sequencer in one go. Just set the beats to 40 (10 bars of 4 beats) with the dial and you’re ready to have a clean start again. It’s somewhat of a hidden option as you have to enter step mode first before you can go to the edit soft key options, you just have to know where to find it but it will come in handy. So by now I hope you have the sequence right, corrected any mistakes or started again. One final check by playing the sequence and then we’re off to record what we got so far to the master track. So we ran out of tracks and in order to go on we need to free them up. Or we could mix to the mastertrack and import this in a new project. This way we can easily go back to the first project to make some changes or whatever. The first project will be preserved and everything is saved including the state of the track sequencer. This is a much better way of working than to throw everything away so we will take this route. But first we need to do a mix to the mastertrack so hit the [stop] button if you’re still in step mode then use exit to return to the main/home screen. If we would press [play] now, all the loops would start to play at once, this is because you have to tell the R8 to use the track sequencer when you’re not in the track sequencer itself. It’s not active by default, you have to turn it on and you do this by using the soft key beneath TRKSEQ. Once it’s on you can hit the [play] button and the sequence is played back and we can record it to the mastertrack. If you’re happy with the mix we can move on and create new project. 1) Create a new project. 2) Press the track button and make sure the track indicator of the first track is lit. 3) Press [Enter] while the first option (TAKE) is selected. 4) In the next screen, scroll down to “OTHER PRJ” and press [Enter] again. 5) Press [Enter] while the first option (PROJECT) is selected. 6) Choose the project with the loops and the master. 7) Scroll down to “NEXT” and press [Enter]. You’ll now see all the wav files of the other project. 9) Change the name to avoid confusing the file with the master you will make for the new project. I usually add P003 or something like that to the name. 10) While you’re at it set LOOPMODE to on for this track. This can be confusing because the tempo of the project is set to the detected tempo of the first loaded file. There’s no point in setting the project tempo before you have loaded any file because the tempo will be overwritten. OK we’re ready for the next phase of our song. Now it’s all up to you how you go on, as for me the first thing I’m going to do is having the loop (the master from the first project) play 2 times. Then I will load the “Kit 2 Dry crash + kick 01.wav” from the “LA DRUM SESSIONS 2/Kit Hits/Kit 2” map onto track 3 & 4 to add some accents to my basic drum track. I will record some bass with the guitar bass simulator and add rhythm guitar all with the built-in effects and turn them into loops. 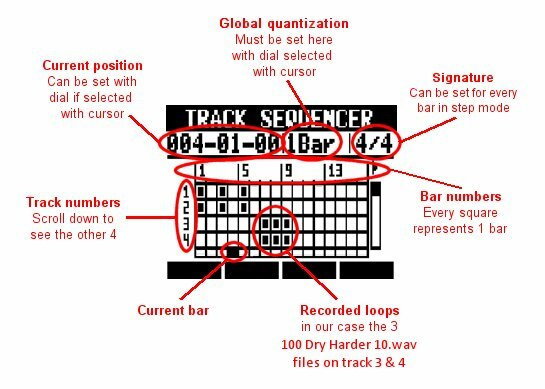 Have fun guys, hope this helps in understanding the track sequencer. And don’t stop with using loops for the drum part you can use it for anything even rearranging a complete song. Dude, i’m from france, I owned a R8 a few weeks ago…. So, I haven’t read/test all, but I will: thanks for what you’ve done about R8, it looks clear, a cool tutorial!! This is great. I didn’t know where to get started with the loops and this explained it really nicely. I started by re-doing your first sequence on my R8. Then moved on to build my own. Thanks a lot for taking the time to put it together and post. Great to read and follow the method described by you. You should really give it a thought to publish a manual on the Zoom R8. Keep the tips coming!